Here’s Captain Herman, on the left in the photo. Yes, the one with the cheerful grin (!). All kidding aside, Herman is a fun guy to be around. You’ll find out for yourself once you step aboard. He’s a true dyed-in-the-wool Texel Fisherman! Born and bred in Oudeschild. He and Frido are related, by the way, but only by marriage. Herman’s got a wealth of action-packed stories. And he knows everything there is to know about the Wadden Sea and the fisherman’s trade. Just let Herman do his thing: on board the cutter is where he’s at his best. You can recognise Captain Frido by his red coveralls. He’s another tough seaman! And, like Herman, he’s worked his whole life as a fisherman. Ask him anything about fishing, the Wadden Sea or Texel, and you’ll get an answer. In German, if you like. We should note: that’s fisherman’s German, which is practically pidgin. 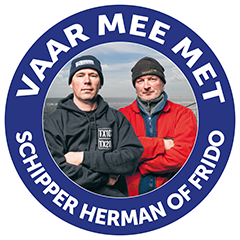 In any case: Frido and Herman always do their best to make sure guests have a fantastic time aboard their cutters. In Japanese or Russian if need be: their customer service knows no bounds. And that only makes things more fun. Motors: Total of 5 motors. 2 propulsion engines, 1 bow thruster and 2 generators (220/380 volt). Skybox in front of the mast offers a fantastic view. Galley (indoor space). Large gangway for getting onto the sandbanks. Certified by the Dutch shipping inspectorate.